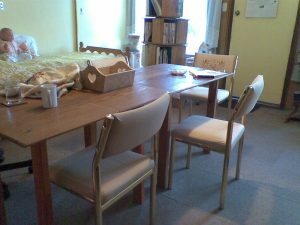 I thought you might like to take a look at our new 'Studio', I call it that with tongue firmly in cheek, as it is our bed room with table set up for our class. It is small but well up to having 6 girls stitching plus Monika and myself, plus assorted 'staff'. 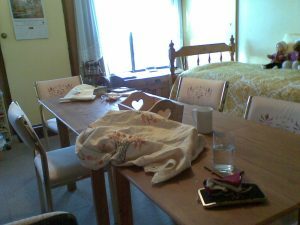 The photo shows it only set up with the small table, we can add another long table which lets some of the girls us a sewing machine as well. 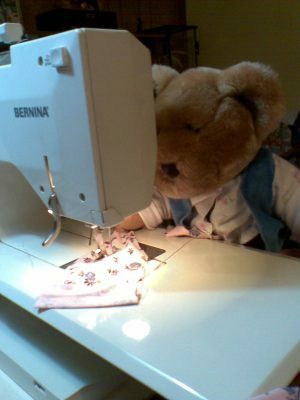 Here is one of the 'staff' on the sewing machine very busy stitching, ha ha. Well I will be able to show you my completed bell pull soon, I have just to hem it. Also there are some new colours from Gumnut Yarns which I will upload for you. They come in all weights of her threads and look great.